Why did Julius Caesar cross the Rubicon? Albert Einstein is supposed to have said: “Never memorize what you can look up in a book”. In Einstein’s days, books were unequaled as source of information. We, on the other hand, live in an age where nearly everything can be accessed through the magic vehicle of internet. Following Einstein’s logic, then, nothing is worth memorizing anymore, because everything can be looked up. But, of course, that is probably not what old Albert was getting at. Most likely, the advice he wanted to dispense was that you should not waste your time by committing unimportant details to memory. Rather, your focus should be on understanding the bigger picture — on how things relate to each other. To ‘learn’, we need to do more than merely feeding ourselves new information. Expanding our intelligence requires connecting new materials to what we already knew. That, in turn, requires something to connect to. There’s no adding branches without a solid trunk. The very possibility of genuine insight requires a memorized base. Without it, data you consume will not be added to your tree of knowledge. Rather, they will float in the air for a couple of weeks or so, before being taken away by the wind. To learn how to live, we need to (among other things) discover patterns between behavior and consequences. Likewise, if we acquire knowledge of this sort it needs to be connected to what we already knew in order to be a lasting addition to our tree of knowledge. The problem is that we only accumulate such knowledge very slowly: the occasions on which we truly learn something about why our behavior had the results it had are rare. Hence, building a solid trunk of practical knowledge is a lengthy process. To speed this up, we should study history. You might be skeptical about the life-improving value of knowing when the second world war ended or about the point of being cognizant of the date on which the French Revolution took place. Firstly, unless you’re a historian, and apart from having a generally accurate mental model of the history of mankind, remembering dates is not very likely to aid you in attaining your goals. Secondly, dates can be very easily looked up. Hence, you should refrain from allocating large fractions of your memory to storing historical data. That, however, does not mean that the study of history is useless. By contrast, it can be extremely useful. As it happens, it involves a lot more than memorizing dates. Almost 2500 years ago, the Chinese philosopher Mengzhi (372 BC–289 BC) — follower of the famous sage Confucius — had some useful insights about how we can learn from history. When done right, studying history yields two kinds of advantages, he argued. One, studying historical examples from different times and places allows us to identify the likely effects of different types of conduct. How did those heroes accomplish all these great things, and how can I become like that? What precisely is it that Nelson Mandela did that makes us admire him and how can we emulate his conduct? Two, stories from history offer possible directions for our lives; they provide us with scripts and encourage us to try these out. These people are not dead yet, but without the examples of Tim Urban (the philosopher behind WaitButWhy) and Alain de Botton (the philosopher behind The School of Life) the script of the academically trained philosopher who writes blogs like these would not have occurred to me as a possible way of living. Like that of most ancient Eastern philosophers, Mengzhi’s prose is rather vague. Let’s embrace the interpretive freedom that grants us — isn’t it lovely how philosophy isn’t a science? — and take him to say that reading history is not a detached intellectual activity, but can be done with an eye to optimizing ourselves. After all, the benefits Mengzi identifies are clearly relevant outside of the classroom. When done properly, the study of history is about self-improvement. History is not just about which battle took place on what day. On top of what happened, it also seeks to understand why these events unfolded as they did. On top of collecting historical data, it involves explaining the past. To do so, it investigates why certain deeds had the consequences that they had. And this — the study of the results of different decisions in different contexts— places the study of history in the very center of our daily lives. For, if there is one thing we all have reasons to be interested in, it is why our acts give rise to the sequence of follow-up reactions that they cause. 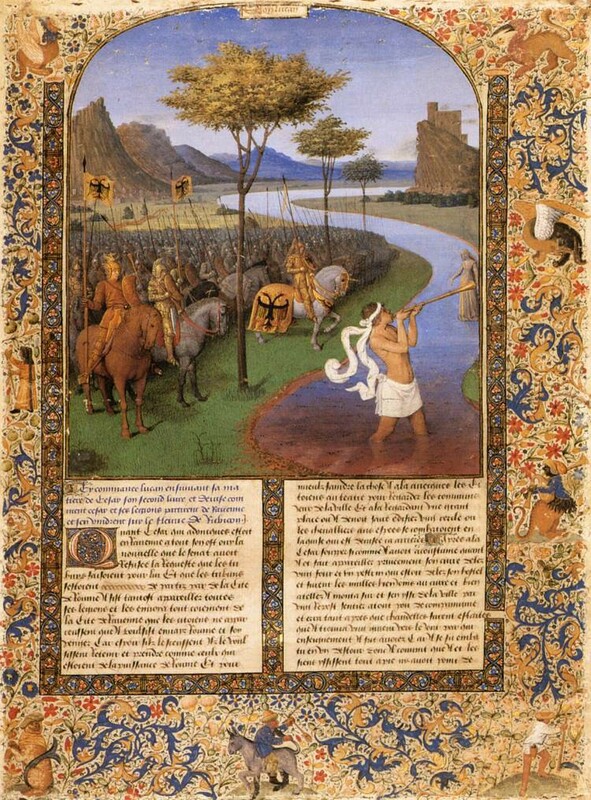 Why did Julius Caesar decided to cross the Rubicon with a part of his army in 49 BCE? Why did that have the consequences it did? To answer such questions, we need to think about how larger contexts impinge on the impact of behavior. Doing so will improve our understanding of why things happen as they do, without having to undergo the events ourselves. We gain practical knowledge, ‘for free’. Studying history, then, helps in acquiring a solid trunk for our knowledge-tree of life. Now, the final step of the argument for the value of studying history. In his TED-talk-went-viral, Ken Robinson points out that our educational system was designed to serve the needs of an industrializing world. It teaches kids to do the job they’re supposed to do in the way it’s supposed to be done according to the script of the big factory that is society. Schools groom us to be a properly-functioning cog. The problem is that the contemporary economy is no longer industrializing but globalizing. There are plenty of countries where people are willing to be obedient and work harder for less money than us. We cannot out-obedience the competition. The way we educate our children is broken. Look at the bright side: that means that there are plenty of opportunities for improvement. Let’s think about that together. Please consider this question: in today’s world, what abilities should one gain by successfully going through the mandatory schools? According to Seth Godin, we should teach our kids two things: how to lead and how to solve interesting problems. If we cannot out-obedience the competition, we should out-lead and out-solve them. To start building our knowledge-tree for these abilities, we normally would need real-life experience. However, if we study history like Mengzi told us to, history will give us some of that experience for free. Examining why this action done in that sociocultural context had the effects it had improves our understanding of how the world works and contributes to our practical knowledge — understanding behavior makes us better leaders and better problem-solvers. Therefore, in a globalizing economy, the study of history is more relevant than ever. How did Caesar get his army to join him in his illegal act? How did Caesar fix the malfunctionings he diagnosed in the Roman political system?